July 2016 lived up to it’s word as a hot summer month, temperatures consistently reached at or above 90 degrees for 15 out of 31 days of the month. 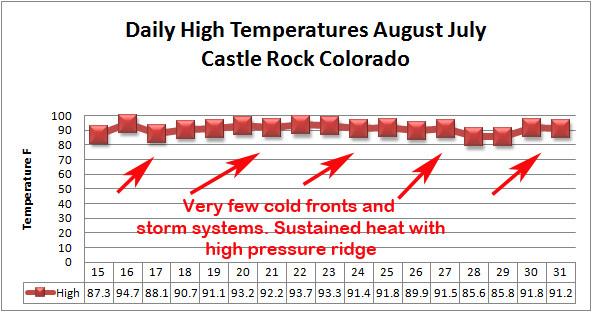 These temperatures are very warm for Castle Rock, Denver saw even more 90 degree days, all in all it was a very warm month. As El Nino begins to die off, the big question remains whether we will see a transition into a La Nina pattern or neutral pattern. 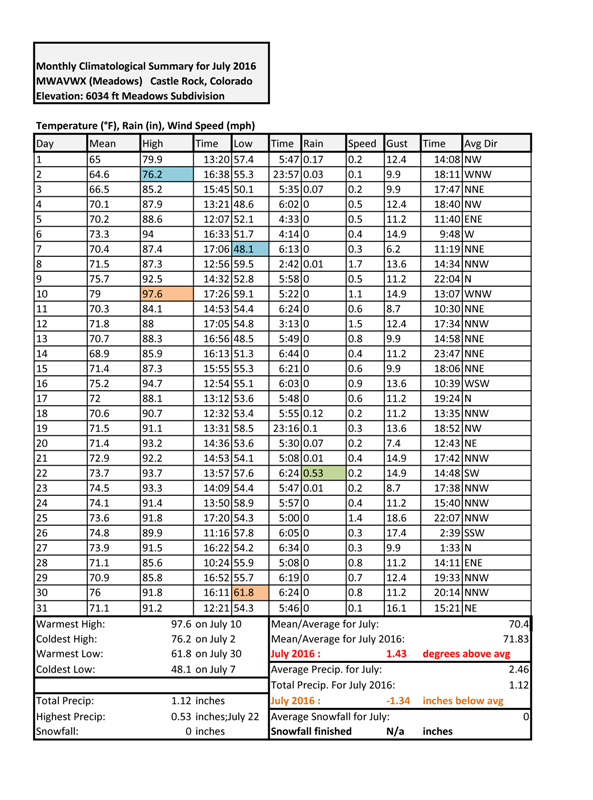 So far July has not given us any hints as of yet, it behaved as a typical July month in regards to temperatures but was notable drier than normal as the monsoon never really established to give us large amounts of rain. 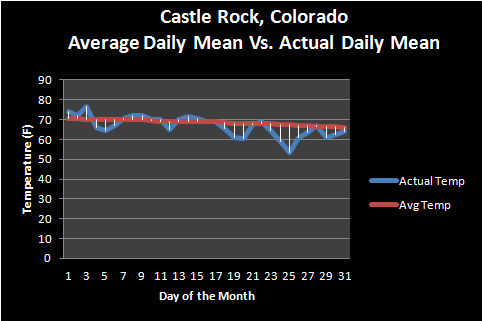 July finished 1.43 degrees above average for the Castle Rock area, this is not a huge number but is notable. 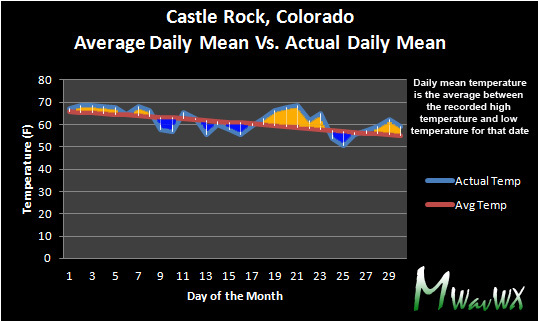 July is our hottest month of the year statistically in Colorado. For us to be above average, the mean temperatures (combination of daytime high and nighttime lows) has to be quite high. You can see this in the graphic above, nearly the entire month featured much above average mean temperatures except for the first 3 days. July is usually one of our wettest months but didn’t live up to that statistic this year. July and August make up the tail end of our “wet” season in Colorado so for us not to hit average for the month can mean drier times ahead. Luckily this year has been exceptionally wet so I don’t foresee drought conditions in the immediate future, but August will be a month to keep a close eye on. 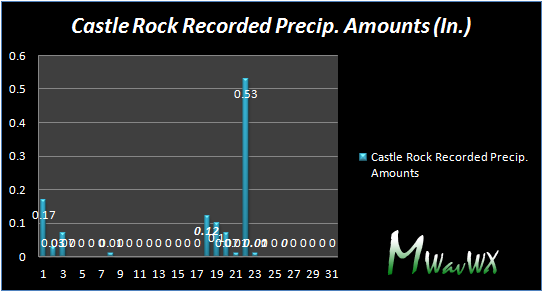 Observed precipitation for the Castle Rock area. 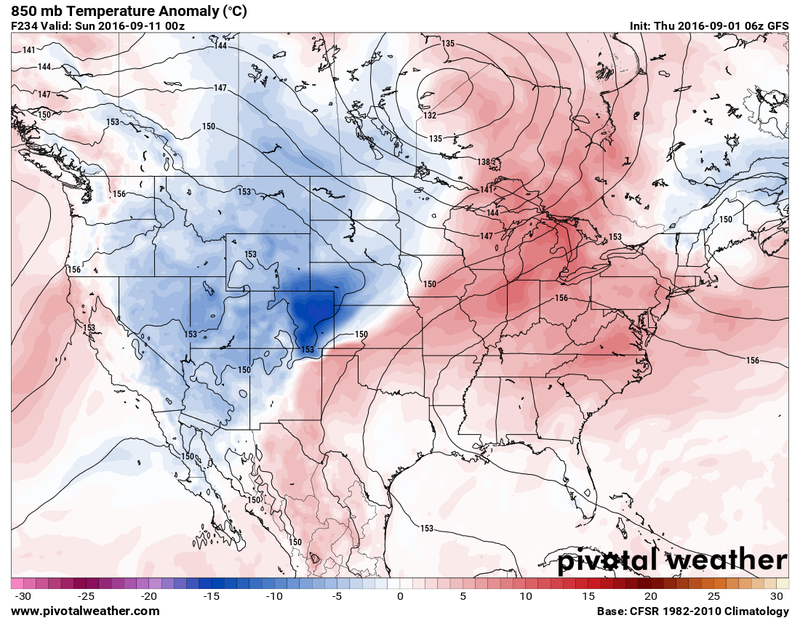 Note the absence of an established monsoon later in the month. The monsoon never kicked in for July, usually we see the second half of the month feature strong, slow moving thunderstorms that tend to dump large amounts of rain. 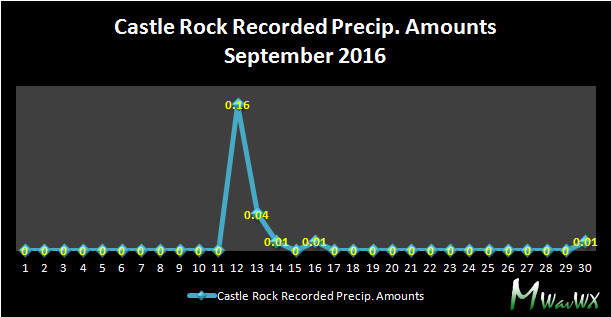 We saw decent amounts of rain scattered throughout the beginning of the month and a few days in the middle. We will have to see how August plays out to determine if we are entering a sustained dry period, one month is nothing to get concerned about in the long run. August is predicted to have an equal chance of above average or below average temperatures based on the latest Climate Prediction Center outlook. I would imagine based on what I’ve seen with models that the month will finish average to slightly above average due to strong ridging in the atmosphere. I have seen one CPC graphic that predicted well above average temperatures for the middle of the month (around August 15-17) and this is what leads to me to believe we could see another warm month overall. The Climate Prediction Center is also recommending an equal chance of above or below average precipitation for the Northern and Eastern parts of Colorado. The Western and Southern parts of the state are showing to have a slightly elevated chance of above average precipitation. 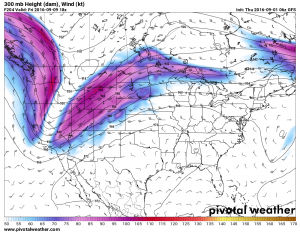 I’m not totally sure the above average precip will materialize for the Southwestern areas of Colorado mainly due to the fact that a monsoon weather pattern has had trouble establishing statewide. For areas closer to home and along the front range, I’m leaning more towards an average to below average precipitation total for the month. We shall see how the month turns out, an absent monsoon could make August dry. The latest modeling I’ve seen shows a dry start to the month and the second half of the month dry as well. 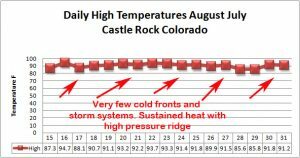 August 2016 surprised many of us watching the weather along the front range of Colorado. What we expected to be a warmer and drier month based on previous trends turned out to only be partially true. While the month ended extremely dry, the temperatures overall finished below average. 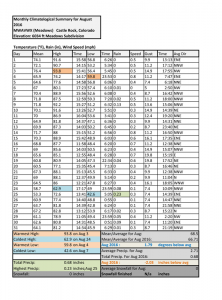 As we began the first 2 weeks of August, it looked like another scorcher was on the way with temperatures consistently in the upper 80’s and 90’s. By the second half of the month, our weather pattern switched dramatically into what we would see as more of a “fall-like” weather pattern. When we average out the temperatures for the month we can see that we spent a large part of the second half slightly or well below average. This is in contrast to the first part of the month where we saw at or above average temperatures more consistently. 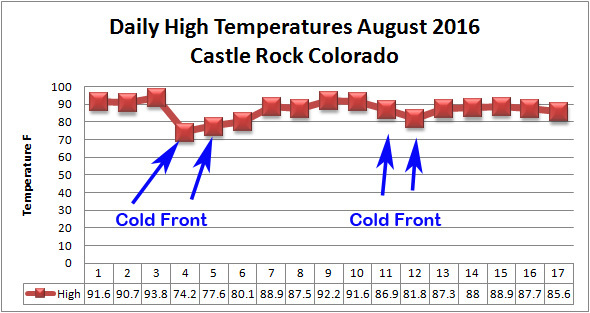 I mentioned this in an earlier article but the main difference between July and August this year was as soon as we hit the middle of the month in August, we began to see more and stronger cold fronts move into the area. 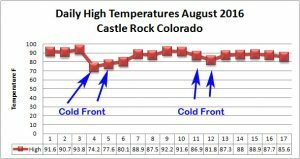 August 2016 temperature trend…notice the cold fronts? 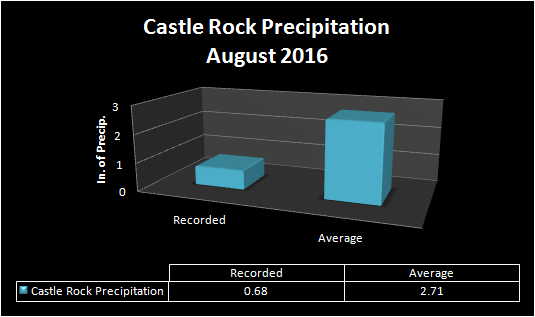 There were not many surprises when it came to how much rain we received this month. 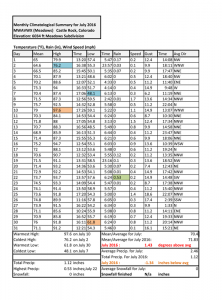 I expressed some concerns at the end of July about the monsoon which is the weather pattern is what gives us a majority of our precipitation for the year and usually kicks in later in July and into August. 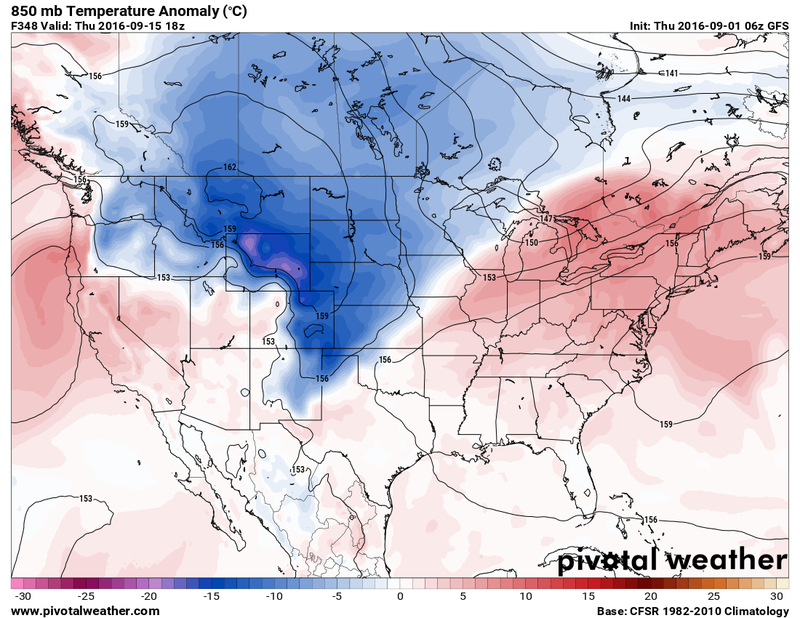 When we don’t see the pattern establishing by late July and models don’t look promising for August we get worried. This weather pattern never did truly establish in August, despite the fact cold fronts moved through and brought us a bit of rain here and there. The above graphic shows that while we did see rain (almost always accompanying those cold front systems) we never got storms that amounted to that much. Denver saw a similar setup, they were so dry that August 2016 will go down as their 8th driest August on record. In sharp contrast, our friends to the South in Colorado Springs and Pueblo received anywhere between 2-6 inches for the month… well above average for those areas! The Climate Prediction Center doesn’t give us a lot help this month as their outlooks call for equal chances of everything… translated to we don’t really know it could go either way. So rather than display the graphics from them we will take a look at a bit of long term modeling. These models are not windows into the future, at this long of range they may not verify at all so take this with a grain of salt. 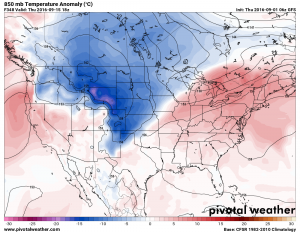 What we are looking here is not specifics but trends… we are looking at the bigger picture to help make a best guess at the long term forecast. I will be the first to admit my long range forecasting skills are still something I need to work better at but when we see things like this we can at least make an educated guess, which is how I arrive (viewing this model and several others *never view just one*!) at the conclusion below. 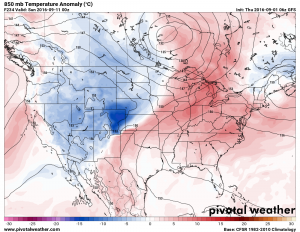 Note: The Euro was another model I looked at and while it does show the troughs clearly as the GFS does… it shows them much weaker and with less impact. 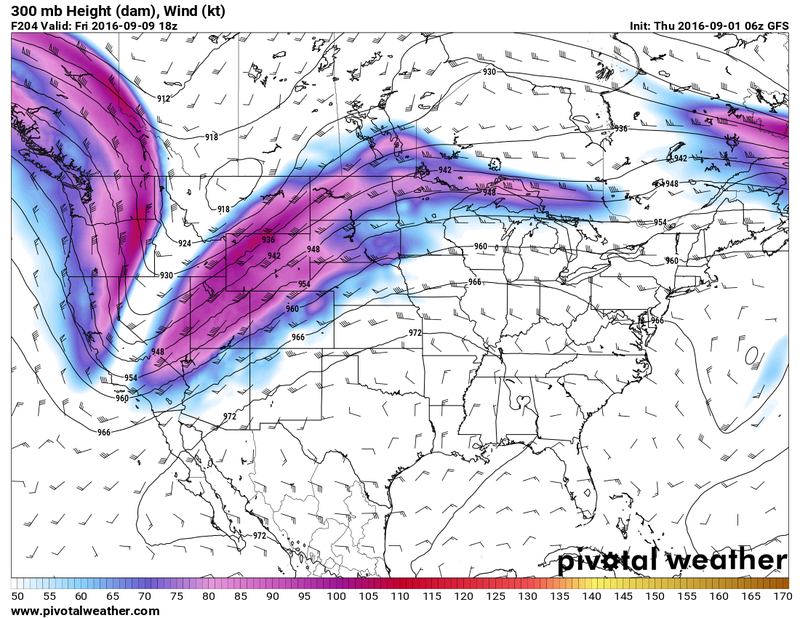 This would mean less rain and less colder air for us along the front range. This will be something to watch! 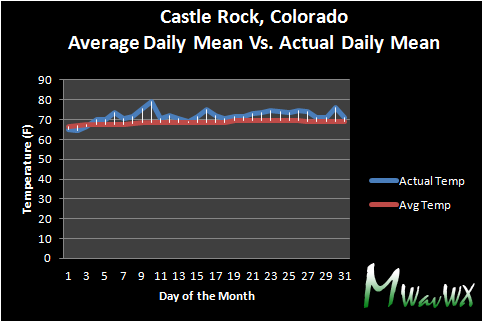 For Castle Rock Colorado I see September being a pretty average month: warm temperatures initially will balance out with cooler temperatures expected in the middle of the month. 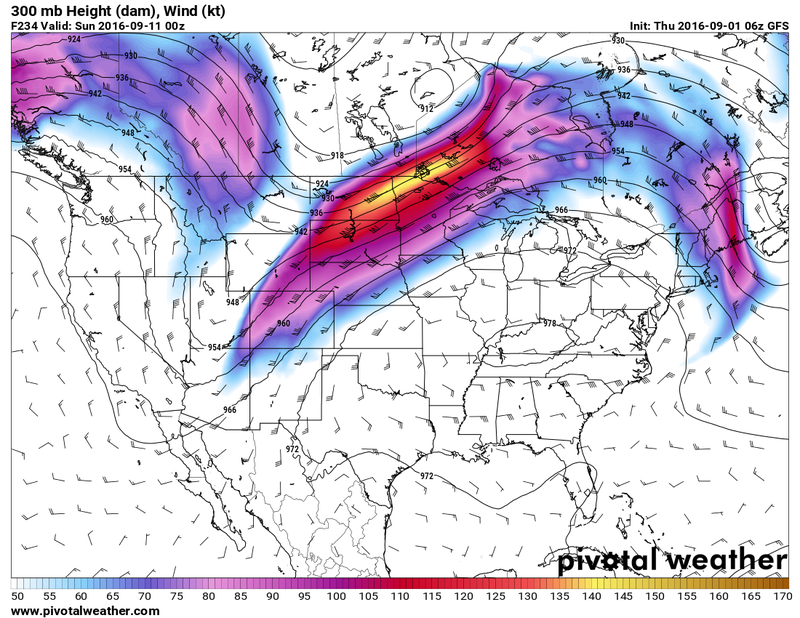 I imagine the first week of September will be warm with slight chances of storms here and there. 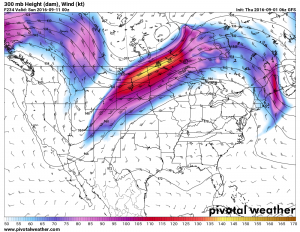 We should look for the middle part of the month to be a bit more unsettled with cooler and wetter weather, but how strong those storm systems become and how much of an impact they make remains to be seen. September for 2016 finished drier and warmer than average, while I wouldn’t say it was abnormally dry or warm the month did mark the third consecutive month in a row with below average precipitation. Things are indeed getting crispy along Colorado’s front range folks! Even though we were projected not to see a La Nina pattern this year, our weather sure is behaving like it, at least in the precipitation department and with the overall weather pattern and storm track. Looking at the mean temperatures for each day during the month, everything seemed relatively average. We saw no huge, consistent temperatures warmer or colder than normal except one period in the later middle part of the month. This block of warmer than average temperatures helped push the month above average overall. The cold snaps were not cool enough to move us closer to a normal monthly temperature. While I wouldn’t say we finished well above average on temperature, it was certainly warm enough to be notable. September is typically one of our drier summer months so it doesn’t take a ton of rain to push it above average. We didn’t see nearly enough to even come close to average this month. A wet period in the middle part of the month was the only decent shot of moisture the region saw but the amounts from that storm system were pretty low. 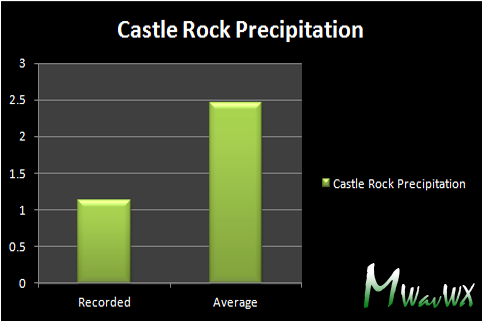 For Castle Rock Colorado the measured precipitation finished 0.99 inches below average. 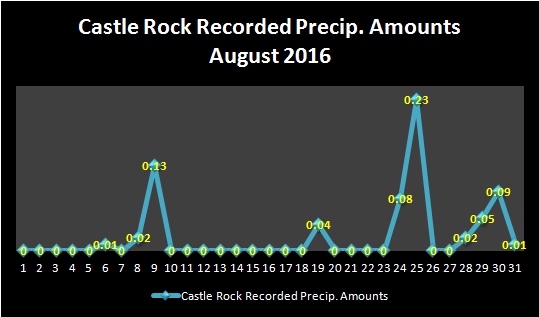 Castle Rock has now seen 3 consecutive months with below to well below average rainfall. Moderate drought conditions continue to creep down along the front range foothills and Denver area, but Douglas County currently has no areas under a “Moderate Drought” designation. Hopefully October will bring some relief to this abnormally dry pattern across our area.